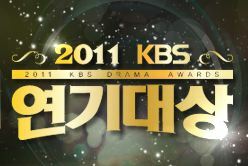 KBS TV station has held its 2011 KBS Drama Awards on the night of December 31st, 2011, the last day of the year, not only to celebrate the arrival of new year, but also to recognize the excellency of actors, actress and dramas over the past year. The timing of 2011 KBS Drama Awards was overlapping with 2011 SBS Drama Awards, and it’s interesting to see that some actors appeared on the both two awards ceremonies. 2011 KBS Drama Awards are hosted by three MCs, namely Jun Hyun Moo, Joo Won, and Han Hye Jin, all of them except Jung Hyung Moo received some awards during the ceremony. Here’s the full complete list of winners for 2011 KBS Drama Awards.